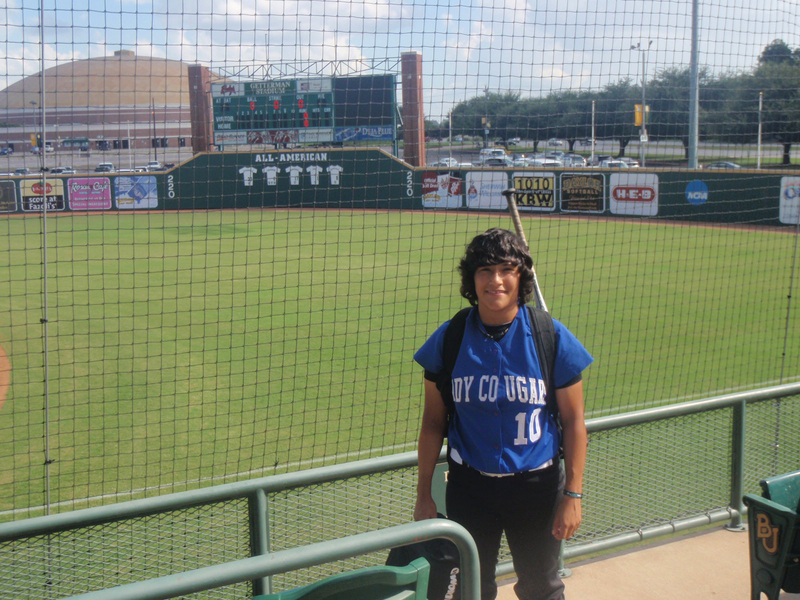 Coastal Bend College sophomore Liz Urquidi, a returning softball player, travelled to Waco on invitation to take part in a regionwide women’s softball tournament. College athletes from across Texas and New Mexico competed in Fuddruckers Junior College All Star Weekend, a showcase for top softball and baseball players. Urquidi was accompanied by CBC Head Softball Coach J. Estevan Vasquez and teammates Kimberly Maldonado and Noemi Trevino. Urquidi, whose high stats from last year’s softball season earned her a spot on the all star team, took part in the Waco tournament for the first time. “I learned a lot from others about how others play,” Urquidi said of the experience. While this was not her first tournament, it was the first she played in as a college student. She took the opportunity to get a close up look at season competitors and also to pick up a few pointers. She played the outfield. Region 14 East All Star Team, with Urquidi, tied for first place with Region 14 West All Star Team. Urquidi, an El Paso native, is the daughter of Lori Tovar and Baltazar Urquidi. Her siblings are Samantha, Erin, Jamie, Mariah, Baltazar III, Josh and Nathaniel Urquidi. In high school, Urquidi was named to the All-District Second Team in her junior and senior years. She was also district champion in wrestling. She is returning to the college field in the spring as a sophomore and criminal justice major. “We are in one of the hardest conferences,” Urquidi said. “The people we will be playing are tough!” She will take to the field next year with primarily freshman players, but is looking forward to having the best season ever. Softball games will start soon for CBC Lady Cougars with off-season match-ups and tournaments in Corpus Christi, Alice, Kingsville, Beeville and San Antonio. For more information about Cougar sports, contact Coach Vasquez at (361) 354-2721 or jevasquez@coastalbend.edu.